Sister Marie Noel Aranda S.P.C. Sister Marie Noel Aranda SPC died peacefully at St. Paul’s Convent on Friday, 14 October 2005, at the age of 83. A Mass of the Resurrection was held at Christ the King Chapel on Wednesday, 19 October, followed by burial at St. Michael’s Cemetery, Happy Valley. Sister Marie Noel was the 10th in a large family of 12 children from Iloilo, The Philippines, but spent forty-five out of the 59 years of her religious life as a missionary in Hong Kong. After her final vows, she was sent to Hong Kong in 1954 and was assigned to St. Paul’s Hospital where she displayed a keen ability and determination to adapt to her new surroundings, its culture and people. Since 1963, she had been superior and matron of either St. Paul’s Hospital or St. Teresa’s Hospital. From 1966-1978, she served as provincial assistant. 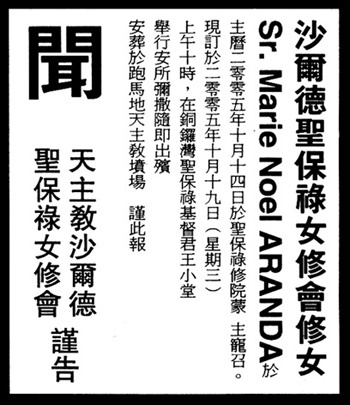 She set up the Pilot Scheme for Pupil Nurse Training at St. Teresa’s Hospital in 1969, contributing to the development of nursing training in Hong Kong. A well-respected and competent administrator, she was responsible for the building of the north and west wings of St. Teresa’s Hospital, completed in 1972, as well as the extension of St. Paul’s Hospital, completed in 1976. She was also involved in the planning and construction of the newly completed main block of St. Teresa’s Hospital from 1996-2002. At the end of 1986, she returned to The Philippines to serve at St. Paul Hospital in Iloilo City. She set up the Madre Antoine Centre, a charitable organization providing free health care and medical treatment for the deprived and disadvantaged. But she returned to Hong Kong in July 1992, serving first as infirmarian at St. Paul’s Convent, then once again as superior at St. Teresa’s Hospital. Sister Marie Noel will be remembered as a kindhearted, loving and generous person. Fired with fervour for her vocation, but at the same time a capable professional with the vision and enthusiasm to run a hospital according to Christ’s mission to heal the sick. Through the loving care and thoughtfulness she showed to hospital staff, she earned the respect and affection of all - from doctors to the minor staff. To them she was more like a mother, transcending her role as hospital administrator. Constantly attentive to the needs of others, she was always ready to help in any way she can. As well as her being a good religious, ever mindful of the sisters’ spiritual formation and human development, her optimism, cheerfulness, smile and laughter will also be always remembered. Her family, relatives and sisters are grateful for prayers and Masses for the repose of her soul.